This pose was my kryptonite. There was a time, that if I heard a teacher queue this pose, my whole body would cringe. I just didn’t like it. It was a pose that didn’t fit naturally, I couldn’t muscle it (and shouldn’t muscle others either), and progress was extremely slow. I’ve never had major knee injuries, so that wasn’t the problem. My knees were tight, and combined with my fleshy legs, it seemed impossible to find ease. I built a mental wall around this pose. Before working with it or even trying to find the posture, negative conclusions had already been made in my head. It became a self-fulfilling prophecy. Working through these types of challenges is where I find the true spirit of yoga. This is when the practice transforms from shapes on a mat to Yoga. Vīrāsana or Hero’s Pose is a big knee, hip, and quad opener. 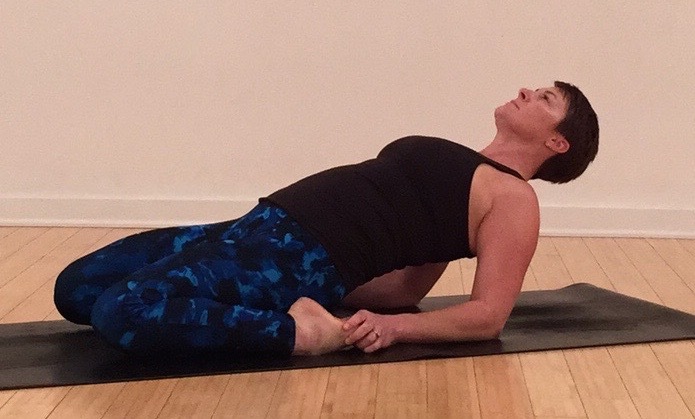 The reclined variation is a back bend and opens the front gates of the body including the psoas and hip flexors. If your knees are compromised due to injury, you may want to be generous with props or avoid this pose all together. Option 1 – Kneeling. A thin blanket under the knees can be used to cushion sensitive knees. From Down Dog or All Fours, space the feet and knees hip distance and come to high kneeling. With the tops of the feet flush to the mat, sit the hips down on the heels. With a long spine, reach the tailbone toward the heels without tucking. Rest the hands on the thighs and soften the shoulders. If this is too much compression on the knees or too intense through the quads, prop the hips with a block or blanket. If you notice numbing in the feet or you loss of blood flow, prop the hips up higher to avoid such deep compression. Stay for 5-10 breaths if possible. When you come out, find Half Plank or Down to counter balance this pose. 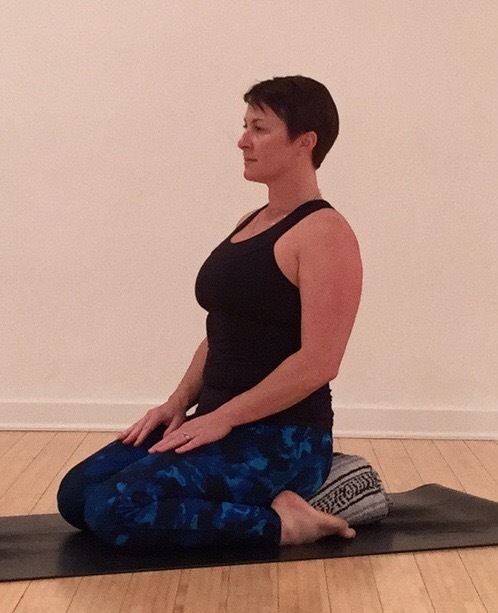 Option 2 – Vīrāsana. Return to high kneeling with the feet and knees hip distance. Adjust the knees slightly narrower and the heels slightly wider to make space for the hips. Sit the hips back towards the floor. The feet should align just to the outside of the hips with the knees pointing directly forward in line with the hips. If needed prop the hips on a block or blanket and find the right amount of knee compression and quad opening. To maximize the rotation of the knee, press the blade or pinkie edge of the foot towards the floor. If needed, you can gently press the thumbs into the pinkie toes or heels of the hands onto the blade edge of the feet to coax the opening. As you breathe, find a gently drawing in of the belly and ribs. Option 3 – Supported Supta Vīrāsana. When your hips can come completely to the floor without support you are ready to move further. (I had to stay at option 2 for a long time!) Gently tone the belly and ribs toward the spine and begin to lean back. Keep the spine long and the neck in line with the spine as you recline. Come first to the hands, reaffirm the length of the spine, the reach of the tailbone, and the heaviness of the knees. If the pose has degraded at all, then scale back. If the integrity of the pose remains, and you feel you can go further, bring the elbows to the floor. The head can stay in line with the spine or it can be released back to expose the throat. Avoid hunching through the shoulders and dumping into the traps. 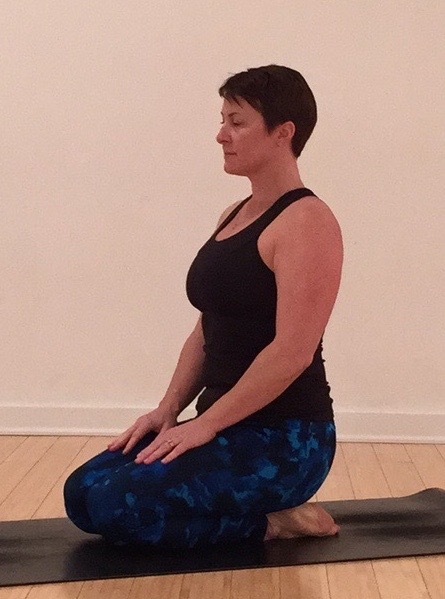 As you slowly exit the pose, return first to the kneeling posture, pause for a few breaths, then proceed to exit. Option 4 – Supta Vīrāsana. To go further in the pose, release the back all the way to the floor. Hands can be along the body, out to the side or overhead. The knees stay heavy to the floor. If they begin to lift away, it’s a sign you’ve gone too far. Keep the gentle toning of the belly and ribs and reach the tailbone toward the knees. Keep a small, natural curve in the low back. If you notice a bigger gap, back out or support with a blanket. Soften and surrender towards the floor. When you are ready to exit, press into the elbows and come up slowly. What poses do you build walls around? Better yet, have you predetermind outcomes for life experiences? Give yourself the benefit of an open mind and some space for these experiences to unfold as they will in their own time. In some cases this may require a heroic effort of patience. As always, work where you can find the right balance of work and ease, making sure to keep the body safe. Follow this #PowerPose challenge @suzannewrightyoga on Instagram or at Suzanne Wright Yoga on Facebook. If you post your pictures or about your experience be sure to tag #PowerPose and @suzannewrightyoga.